All through my senior year, I was focusing on two colleges in southern California which I wanted to attend, and planned on running track. I visited each, and decided on the one, mostly for the prestige of their program. I really wanted to give my college career the best shot for breaking 50 seconds, so I continued training all through the summer before moving down in late August. I ran consistently, and continued to improve my stride efficiency by training with the runwithpower system. I attended Trinity Sports Camps again, this time as a group leader. The experience was much better than the previous year, and I felt by the end of camp that I was in the best shape of my life. We actually had a competitive run in the last week of the camp, a 1,000 meter race. 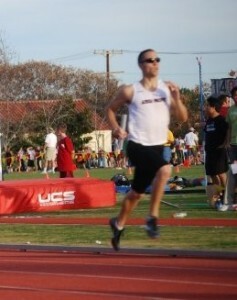 I won the race, surprisingly, beating out several very talented distance runners. It literally came down to a dead sprint in the end, and instead of losing my stride form, I was able to accelerate and remain smooth and powerful all the way through the line. After camp ended, it was time to move down to so-cal and begin my college life. As soon as track started, my coaches had me running with the upper class-men during practice after doing several quality workouts on the hills. Typically, when we would go run long hill sprints, most would fade near the end of the workout, while I would begin to pull away and finish workouts strong. I mostly credit this to the efficiency of my muscular system that I had developed up to that point. Running with much faster upper class-men was intimidating, but at the same time I felt encouraged that I would get better and for sure reach my goal. The next thing I want to talk about is going to be a major controversy in the near future of sports training, I believe. It has to do with the lifting program that I was forced into. The track team lifted four times a week. Our workouts included all the traditional powerlifting moves; squats, powercleans, deadlifts. After my first morning in the weight room, doing “light lifts” and learning “proper form,” my lower back completely seized up. I literally hobbled out of there like an 80 year old man. Not because of improper lifting form, but rather because of all the time I spent breaking my hips loose to achieve greater power and range of motion in my stride, to suddenly force a ton of loaded range onto a pelvis in a fixed plane without neutralizing the negative side effects causes the muscles around the pelvis to tighten up immensely. I spent a lot of time trying to undo all the negative effects of the squats and cleans, but gradually over time, my hips began to actually lose their functional range of motion. After a while though, I thought I was getting better, because my weight was going up, and I wasn’t feeling that extreme tightness in my back. My body had adapted to the stimulus by compensating and as a result, a strength imbalance began to form in my body. Remember Law #1, the body will always react and change based on the stimulus it receives. As my lifting got better, my running gradually go worse and worse. I also began to notice little pains developing in various places in my body. My ankles would hurt, then my knees, then my lower back. Nothing too major, but it was there, and I didn’t like it. I didn’t feel like the fine-tuned athlete I had been only months before, but rather I felt like a deteriorating runner who was toeing the line between healthy and injured. Finally, competition season rolled around. One thing I noticed about my running was that I had an incredible amount of muscular endurance, simply due to the fact that I had done so much more running this season, beginning in September, and having the sunny, 70 degree weather of so-cal all the way through the winter. The difference was my dwindling speed. I had really lost the range and power in my hips, and I didn’t have the natural talent to back it up like the other guys on the team. I went from being in the front of the pack in workouts to fading to the back. My 400 times weren’t all that bad, consistent mid-53, but I seriously lacked in speed. My 200 time never dropped below 24. 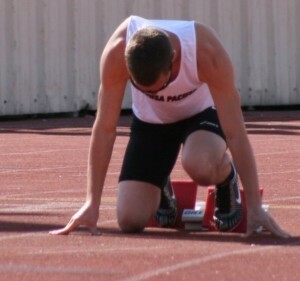 Near the end of the season, I suddenly got to the point to where I couldn’t run anymore and had to sit out our last meet. My hips had lost so much of their range of motion due to tightness at that point that my knees were being stressed at awkward angles, resulting in a pinched peroneal nerve in my knee. It hurt to even bend my knee slightly when I put pressure on it. I could walk around, but I couldn’t run. I knew at that point that I would never achieve my goals if I remained training my body with this style of training. I decided to transfer up to a school in Oregon close to my high school so I could help coach for my former team as well as train using the runwithpower system. Next I will talk about the process of restoring the efficiency of my muscular system over the past summer and where that has gotten me now, and my plans for the future. I have a meet coming up this weekend where I will run the 200, and hope to set a new personal record, going under my current time of 23.48.